Stephen Moore is hopeful that success in the FL t20 with Lancashire will result in being selected for England. The opening batsman, who was born in South Africa, has scored 154 runs in four innings in the competition this season, including two half-centuries. "It would be lovely to represent England," Moore, 31, told BBC Radio Lancashire. "It's always been a dream of mine to play international cricket." 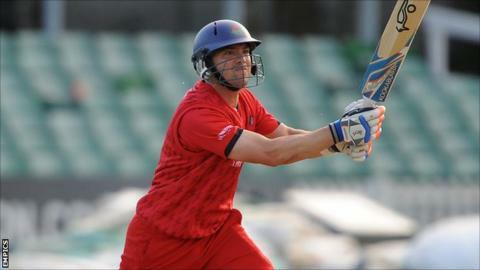 Lancashire beat Durham on Monday to move joint-top of the North group. All-rounder Steven Croft scored 65 not out from 44 balls as the Red Rose cruised to an eight-wicket victory at Old Trafford, a result which takes them level on points with Nottinghamshire and Yorkshire after five matches. Moore was out early in Lancashire's run chase, making just eight, but has been in excellent form in the one-day game in 2012. "There are a lot of talented guys out there doing a good job for their counties," continued Moore. "My focus is on trying to win another trophy for Lancashire. If that leads to bigger and better things for myself and the other guys in the squad, that's fantastic. "It would be great to see some Lancashire guys pushing into some England squads. There's a lot of talent here." While Croft led the way with the bat, Gary Keedy proved to be the star with the ball, taking 4-25 as Durham were dismissed for 121. "I probably bowled better against Leicestershire than I did tonight and I went for 53 off four overs," said the left-arm spinner, 37. "It can happen to anybody. It's just the nature of the game. Tonight I got the break, I got the early wicket and that's the way it goes. "Sometimes when you're chasing a lower total, if you set yourself up to get them in the 20 overs, it can go horribly wrong. "The way the lads played to finish it off was the right way to do it. The partnership between Crofty and Tom Smith was brilliant in doing that."